A lot of people say "I don't want to squash my tone and remove all of my playing expression", which is a fair point if you have a lower quality compressor or it's not set up properly, but a quick look at professional guitar players rigs and most of them will have compression in it, so, that would lead you to believe that compression is actually imperative to a lot of players. So, what does it do..? Fundamentally, it adds an element of control to your playing level - it will bring the quieter parts up and the louder parts down. A great tube amp when driven into its sweet spot will do this, a compressor can bring you that control but a great compressor will give you that feel as well. Many budget compressors give you the squash and squeeze of a driven amp, but you tend to lose all of your playing dynamics, all of your expression. 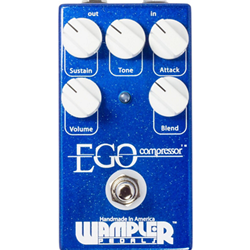 The Ego Compressor will take that element of squash and squeeze, but will allow you to be able to control the effect so that your playing can shine through. It has been said before that the mark of a great compressor is that you can forget you have it on. When Brian at Wampler designed this pedal, the word that kept coming back to him was "transparency". The way the Ego has been designed, there is no coloration of your sound. The tone and blend controls allow you to balance the effect in such a way your signal path sounds so pure when the reality is that the pedal is working extra hard to make your playing tick like clockwork. Now, if you are not familiar with the Ego Compressor, you will probably be thinking "What's a blend control?". The blend is a dry mix, that sweeps between a fully effected signal to zero effect across the sweep of the pot. There will be a point in that sweep that allows you all the compression you need to even out your playing, increase your sustain (if you want it) but without any detraction from you playing attack and feel. That, previously was just a dream, but now; that is a reality. When this amazingly simple yet devastatingly effective control is added with the tone control (that can add a little sparkle to the tone), when this pedal is used as "an effect" rather than as an "always on" (to control your solos or to fatten up your rhythms), a little extra bit of sparkle allows your guitar to sit in that place in the band mix that you have been trying to fit into but couldn't quite find. Just a littler higher, a little sweeter in the mix. This is the effect that you probably didn't realize you needed, but once you have used once, cannot imagine living without.